A while back I saw a super scary video. It was truly horrifying. I still have nightmares when I think about it for too long. I showed a short clip of this video to my wife. She actually screamed at the TV: “Nooooooo!!!!!!! !” She was just as terrified as I was. In this video people were walking the aisles of a big box retail store, scanning toys with the Amazon app. Not the Amazon Seller app. The Amazon app. The one you use to view and buy merchandise from Amazon. These people were looking up toys on Amazon, comparing the price on the retail store shelf, and loading up a shopping cart if the price was even the slightest bit higher on Amazon. They intended to buy this shopping cart full of toys and sell them on Amazon. As if this scenario weren’t gruesome enough, these people were actually encouraging their viewers to go out and do the same thing. 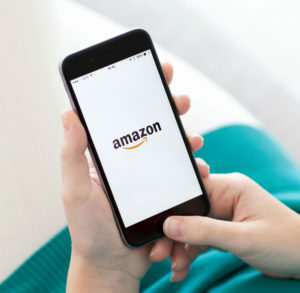 They exuberantly proclaimed that anyone can sell on Amazon, see, look, there’s merchandise everywhere that sells higher on Amazon than in stores. You, too, should go out and buy toys by the shopping cart load, and just send them in to Amazon and wait for your paycheck. The key difference boils down to one simple factor: I never buy an item for resale without knowing the Amazon FBA fees for that item first. If someone were to actually follow the methods these people were using in this Amazon FBA horror movie, they would be hit with fees they hadn’t calculated beforehand and suffer financial loss. 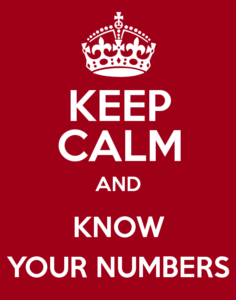 For anyone who wants to make a profit running an FBA business, you have to know your numbers. You have to know all of your expenses, including inbound shipping, taxes where applicable, prep fees, materials, and the cost of any subscriptions or services you buy. 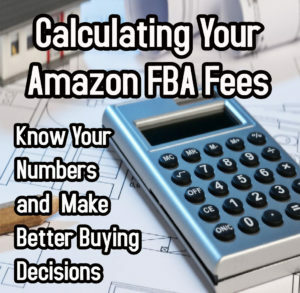 You also have to have a good handle on the FBA fees that apply to any items you intend to have Amazon fulfill for you. If you aren’t aware yet, the name of this blog is Full-Time FBA. About 99% of our Amazon business is through the FBA (Fulfillment By Amazon) program. We do choose to Merchant Fulfill items on occasion (check out our YouTube video where we discuss those occasions), but overall we prefer to stick with having Amazon fulfill our inventory when a customer buys it (see also our blog post “Overcoming Your Fear of Selling via FBA versus Merchant Fulfilled or eBay”). To see the FBA revenue calculator in action, I’ve created a screen capture video explaining how it works. 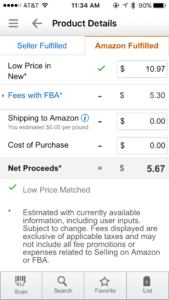 Another easy way to see FBA fees when doing online arbitrage or product research is by using Google Chrome extensions that show the fees right on the Amazon product page. 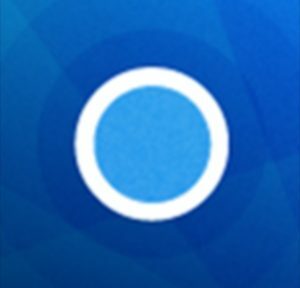 We use Scanalyze (available through the Cyber Monkey Deals website) and love it. You simply click the “Scanalyze” button and the fee calculator pops up at the bottom of your screen. 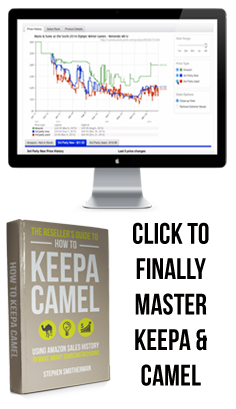 Hopefully you’re equipped now to calculate your fees and know up front what your profit potential is before you buy inventory to send to Amazon. Please don’t become another victim in a scary movie! You can make good choices. 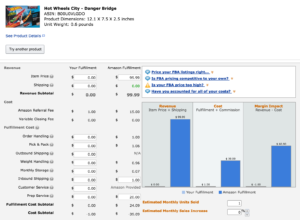 You can build a profitable Amazon FBA business because you know your numbers. We intentionally didn’t include a link because we don’t want to turn this post into a way to publicly shame someone. Humm, nice clickbait guys! Scaryvideo… ? I’m not sure what you’re referring to?? When you advertise (through email or just through article title) to people there’s a scary video you are immediately creating anticipation, and then when it’s not there they feel like they didn’t get what they came for. I’m 99% sure I’ve seen the video you’re referring to, and yea it’s terrible, I stopped taking them seriously when I saw they left that video up for so long. But if you wanted to reference it in front of your audience without showing them or getting a backlash it needed to be a bit part. Do you care to elaborate why you would leave this comment on an article designed to help sellers calculate their FBA fees? I don’t understand what we have to be ashamed of in providing free content on our blog and through YouTube videos giving detailed instructions about how to use an FBA calculator. I think because the link was supposed to bring us to a scary video about retail arbitrage and instead we were brought here…. bad link? Very informative, as usual. Keep up the good work. Great article. When read the information will help folks save big time. For new sellers there is way too much confusion on how to make the right profit from what you choose to sell and what to expect for profit when its sold. I have a question. When looking for retail arbitrage products for FBA, couldn’t we only buy items that we know could sell for three times the amount, instead of figuring out the exact fees? 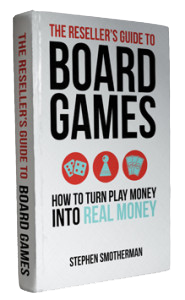 This is usually a good strategy when you are first starting out, but for those who want to make good money over the long term selling on Amazon, you’ll need to learn to find items where you’re comfortable making an ROI of 50%, 40%, 30% and sometimes even 20%. Some see that as risky, and it can be… but even a 20% ROI is better than the stock market. If I don’t happen to have my scanner/phone available for whatever reason, is there a general “cost estimate” rule? For instance, if I find an item for $5 that I know (for whatever reason) that I can sell for double or triple, is there a pretty standard percentage to calculate against margins in order to make the buy decision? If you don’t have your scanner then how would you know what the current sales prices are? You need to compare with the current prices so you don’t make a mistake… don’t assume it’s selling for more on Amazon, you need to know for sure. Thanks for the article; it was very informative! I didn’t have to see a video to know it was scary! As usual a very informative article. Anyone who sells thru Amazon would be wise Amazon to know all the fees in order to know their potential profit before buying the item. As to the controversy over the video I think in the future to avoid this type of feedback don’t use a url like you did in this case with “Scaryvideo” in it. This seems to indicate the url will link to a video even though the email had no indication that the video was a part of your article. Just my suggestion. 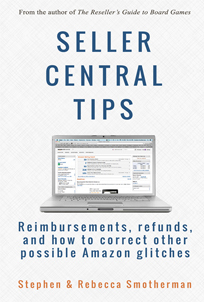 Again thanks for all you do for Amazon sellers. Really! Is is that big of a deal the video wasn’t here? What ever happened to imagination? Great article guys as usual! And FREE advice to boot. Thanks! Here’s analogy for you – How would you feel when you bought a product for specific use because it had one of features you really wanted but haven’t got that feature it promised? Normally, Amazon customers would return it in such case giving it “Not as described” as a reason of return. For anyone who read our newsletter and came to this blog post hoping to see the video we refer to, I will repeat what I commented above: We intentionally did not include the link to the video because we do not want to publicly shame someone. Honestly, I don’t even know where the video link is at this point, and there is nothing more to be learned from watching the video than from the short description we gave above. For anyone who feels that you were deceived by our newsletter as to what the content of this blog post would be, here is a quote from the newsletter that specifically says what the content of the blog post is: “In today’s blog post, I’ll share with you what we saw these resellers doing, what went terribly wrong, and how you don’t have to make the same mistakes they did.” This is exactly what this blog post covers. We were not attempting to deceive anyone. For anyone who considered the newsletter to be click bait, please understand that the definition of click bait is deceiving people into clicking on a link in order to earn advertising revenue from those clicks. We do not advertise on our blog and receive ZERO compensation when someone clicks on a link to come to our blog. If you clicked a link thinking it would be a video and you came to this blog post instead, I sincerely apologize for the 5 seconds of your time that it takes to close the tab and move on with your day. We send out a weekly newsletter with a link to our latest blog post. This week’s newsletter was no different from ones we’ve sent in the past. This article was written with a tongue-in-cheek intro and conclusion designed to make a boring subject (using an FBA revenue calculator) into a more interesting one. Our goal for this blog post was to teach people how to calculate their FBA fees, but we also like to exercise our creativity while we’re teaching. Thank you for your interest in learning how to turn part-time hours into a full-time income through Amazon FBA! We will continue to work towards providing valuable content through this blog and are grateful for the supportive words for the information we provided above. I don’t know what you negative people are talking about. I have seen people doing just what they said that scary movie was talking about. In fact before my education on scanning I thought that scary movie was how it was done. Obviously so have others. Weather or not there is even a movie about it or not, it caught my attention and I for one am happy that it did. You all may be much more advanced than me, but I’m sure it did not come without a stumble here and there, I’m sure that ones who appreciate this blog and would have taken that road are happy the bloggers wrote it. If you’re so advanced then why are you on this blog for anyway? I appreciate all you do, and many others as well! I have not heard of the calculator doing that before. Possibly a glitch. I don’t know what the moaning is about, but I’m not that sharp. ful. Props to both you. Who has time for a scary video – get back to work people – and just watch good videos from the nice people at Full Time FBA. New people, I’d caution to stay away from any items that sell for less than $12.99 (unless they are very small and light). It takes the same amount of work to prep and ship a $20. item as it does a $10. item so make your time count! At a minimum your ROI should be 100%, don’t settle for less.